At the December, 2015 AFOW Board meeting more than $73,000 was granted to several Whistler non-profits, including: Whistler Search and Rescue, Canadian Society of Mountain Medicine, Whistler Community Services Society and Whistler Sailing Association. AFOW mission is to raise and distribute funds for health and human services, culture and the arts, environmental protection and outdoor recreation, to enhance the community, benefit the population and foster greater understanding and friendship between the Canadian and American people. 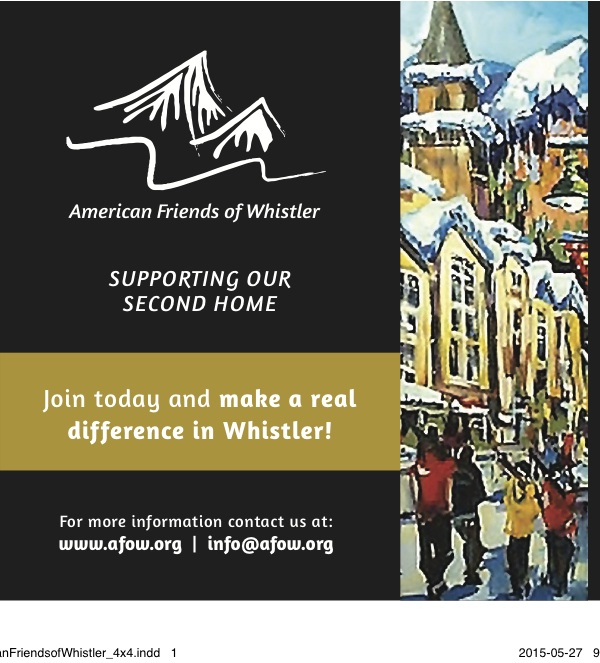 Members of AFOW believe Whistler is an extraordinary place, and that by becoming involved philanthropically in the community, the community benefits, and AFOW members gain by becoming more closely associated with the local people and issues. Since its founding in 2002, almost $1.4 million has been raised and distributed to local charities. For more information about AFOW go to http://www.afow.org or follow us on Facebook.